The clean lines of these contemporary ridged planters contrast well against the soft contours of box balls, bamboos, phormiums, hostas and grasses. Alternatively set off their surface against the shimmering silver foliage and purple flowerheads of lavender or verbena. Your Zinc planter comes packaged in a plastic bag, if you've chosen a planter without an insert we suggest that you use this bag to line your Zinc Planter to keep it at its best. To maintain your Zinc Planter and keep it looking lovely, we suggest that occasionally you clean it down with a metal safe cloth or brush to avoid limescale build up after heavy rain. 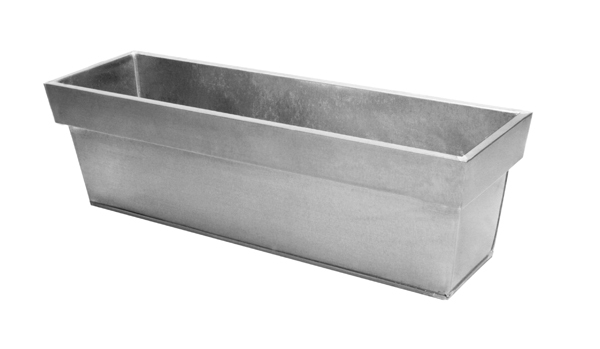 This page is for the medium rectangular ridged planter in silver (galvanised) finish. Also available are the Zinc Edge Troughs - Black and Zinc Edge Troughs - Titanium. "Very pleased with all the products!" "Great value compared to similar products available elsewhere"
"Look nice in my front garden quite contemporary... love the shape of the planter quite elegant . They do dent easily high winds knocked one off its mount but overall a great buy!" "Haven't used them yet but they look great."